Random is a loaded term in the music composition world. For those of us using Eurorack and modular synths, random is omnipresent, but still poses many challenges, both conceptually and in practice. For new composers and producers, randomization seems counter to the idea of creating a fully controlled and composed musical idea. However, this type of modulation can be helpful to inject musicality and motion to otherwise dull and drab sounds, perhaps even critical to creating moving, evocative or realistic sounds. Moffenzeef Modular has designed an interesting dual stepped random source module, The Deviant, that does much of the work for us. The struggle with randomization is control, reining in the chaos from an unwieldy source. The Deviant cuts to the chase, building all of the necessary functions into a compact bundle. Each channel includes control over the minimum and maximum (top and bottom) CV output range with a maximum range of +/- 5 Volts, as well as smoothing of the stepping motion. A trigger or Bang input initiates a new random value. 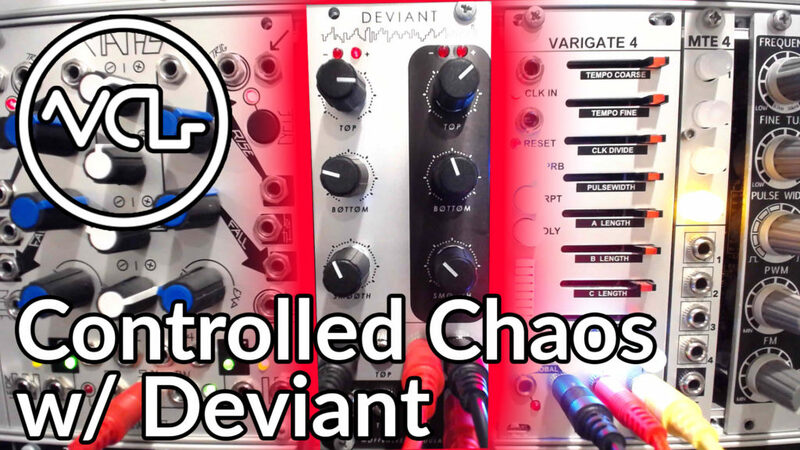 Deviant acts very much like a classic Sample & Hold, taking an incoming CV source (usually noise) and holding a voltage when triggered. Of course, most Sample & Hold modules do not allow for attenuation of the output signal. A VCA or CV attenuator can be used to limit or expand the range of the resulting signal, while an offeset can be used to push the signal into a useful range. I was lucky enough to be invited as a guest (along with James Cigler) on this months episode of Modular Podcast, with DivKid, Greg Gibbons and Matthew Shaw. While discussing our favorite modules of 2016, conversation strayed to our collective love of randomization. Check out the episode for that discussion and much more. How are you using randomization in your modular system? Tell us about it in the comments! We’re starting our next term with Modular 101 and Sound Design very soon, Join Us!